Girls and Games: What's the Attraction? 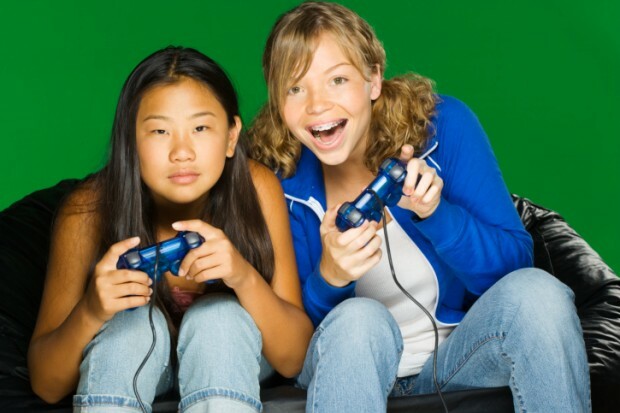 Game developers and academics who have been studying the elements that go into making games more attractive to girls found that those very same qualities are also important components of learning. For instance, girls are more drawn to games that require problem solving in context, that are collaborative (played through social media) and that produce what's perceived to be a social good. They also like games that simulate the real word and are particularly drawn to “transmedia” content that draws on characters from books, movies, or toys. “Something we’ve seen as a tremendous motivator for girls to learn about math and science is that they need to see the connection from the classroom out into the real world,” said Victoria Van Voorhis, the founder of Second Avenue Learning in a recent webinar. Her company has received funding from the National Science Foundation to study how to reach girls through gaming with the help of the Rochester Institute of Technology. They tested a physical science game called “Martha Madison’s Marvelous Machines” with middle school girls in urban, suburban, and rural environments to gauge whether playing the game would increase their interest in science, technology, engineering and math (STEM), whether it appealed to them and if it could improve their understanding of fundamental mechanical devices. “When we asked them about springs and levers, they had no understanding of why they were important in the real world,” Van Voorhis said. “But when we were able to situate those kinds of tools in a real-world context, where they were solving a problem that was directed towards social good, we saw the engagement numbers pop.” girls were talking about physics or game play 76 percent of the time and were only off topic 5 percent of the time. One of the biggest draws for girls to gaming are the passionate communities that spring up around the games. Affinity groups, or what's sometimes referred to as the meta-game, often involve users creating their own story lines, interacting with each other and sharing. Jayne Lammers, a professor at the University of Rochester, spent extensive time studying affinity groups of girls that play SIMs, the game that allows users to simulate real life through the game, and watched girls go from consumers to creators in the space. They wrote stories, solicited feedback from peers, demonstrated self-awareness, and even learned elements of programming and design through their creations. “As we think about how girls are developing these skills outside of the classroom such as affinity spaces, I think it’s important that we think about how to bring it back into the classroom,” Lammers said. But it can be hard to convince parents and administrators that a video game is helping students learn, especially when game-producers have upended some foundational thinking about how to educate – like allowing a student to interpret and analyze a subject on their own before giving them explicit content instruction. “Invoking their interest in the topic through play is a great way to get them to come to their reading or lectures or small group work with an explicit agenda,” Van Voorhis said. She advocates for thinking of learning as a non-linear path, where steps are taken forward, but also backwards and sideways. “The critical thinking and the problem solving that students experience in games create spontaneous innovation,” Van Voorhis said. “It can be the catalyst and the spark to get a kid to that ‘ah ha moment’ that inspire a kid to get deeper into that content area.” And games allow kids to experiment, try new methods and fail without consequences. 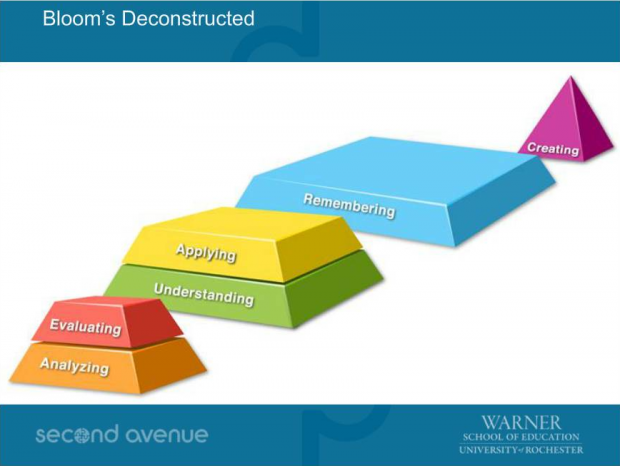 Van Voorhis constructed a different version of Bloom's Taxonomy based on game play, in which students first explore a theme informally, and that process helps them understand written text afterwards. "Invoking their interest in the topic through play is a great way to get them to come to their reading or lectures or small group work with an explicit agenda," she said. A flipped version of Bloom's Taxonomy, informed by game-play.